Brookfield Properties Retail Group, formerly known as GGP, gets their newly renovated open, collaborative and natural lit HQ in just a 20 week period. After Brookfield Properties Retail Group, formerly known as GGP, had their previous headquarters slated for demolition sooner than later, a schedule was crucial for the real estate investment trust. To get this problem solved, GGP partnered with Skender and ARCHIDEAS to ensure that their newly renovated 176,000-square-foot three-floored office would be move-in ready in less than 20 weeks. What kinds of meeting spaces are provided? Strategically placed conference rooms, phone rooms, hubs, and gathering areas to foster a collaborative environment and serve as launching pads for the next great commercial real estate idea. Barz™ paneling systems by Ceilings Plus are located throughout the office in addition to four open hub collaboration rooms enclosed by curved glass. The focal point of the space is the third-floor café that walks out to a 10,500-square-foot private roof deck overlooking Wolf Point and three branches of the Chicago River. At the intersection of Chicago’s three primary neighborhoods – The Loop, West Loop, and River North, the building is metro-rail, car, and bike accessible. Fine dining and casual dining are both offered to the building, as well. Ardex flooring was installed within a 20,000-square-foot area of the space. For specific examples, please describe the product, how it was used, and if it solved any specific problems. One of the challenges was to complete the Ardex Flooring installation process in 8 days before having to shut down the 20,000-square-foot area in order to complete their K13 sound deck spraying across 86,000-square-foot of the space. The design solution weaves the interactive areas and the mix of workspace types together to create an intuitive system of wayfinding over the 3-floor project. Yes. Low-height furnishings ensure unobstructed views, allowing for an abundance of natural light throughout the space, and collaborative areas occupy the space instead of what is normally reserved for prestigious corner offices. What kinds of technology products were used? 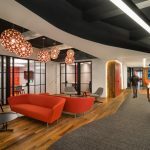 DIRTT Technology was employed within the two small break-out areas of the main hub to collaborate, Fluxwerx Linear lighting fixture, Ceilings Plus acoustic installation.